This Car Destroys Two Classes At The Track!!! 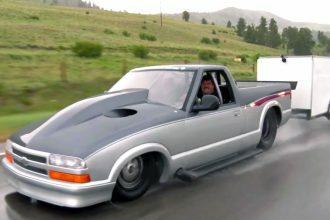 This Nitrous LSx Fox Body Mustang called Beater Bomb is undeniably a winner. It is absolutely a money maker after winning two classes at the recently held annual Ice Cream Cruise. Well, we all know that it is not just about the money but to deliver an impressive performance that will surely wow the crowd. Beater Bomb perfectly nailed both classes and outranking his opponents. The car run for both Street Car and Unlimited Classes and win both category. Not only this, but the competition was tough, including big power nitrous and turbo cars! EPIC Tire Test Leaves Tire Exploded From 130PSI!